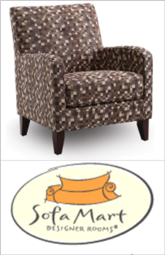 Sofa Mart LLC is a privately held organization and is a franchise of Furniture Row Companies. It has been established in the year 1998. Sofa Mart offers storage or shelves, lamps, rugs, chairs, accent chairs, micro-fiber, fabric leather, etc. Their main goal is to satisfy customers to the fullest. They offer an exclusive solution for fulfilling furnishing requirements of different customers. They respond fast to customer demands and within 2 to 4 business days. As per report from current estimates, the company has generated annual sales volume of $3200,000. Sofa Mart LLC offers more preferences and styles of upholstered and leather furniture at affordable rates. There are currently 0 consumer reviews about Sofa Mart available. Share your review. Please take a note that you are about to post a public review about Sofa Mart corporate office on CorporateOffice.com. This review will be public, so please do not post any of your personal information on this website. If you would like to contact the corporate offices of Sofa Mart, please use their contact information such as their phone number, website, and address listed above to contact them. However, sometimes staff from Sofa Mart headquarters do read the reviews on this website.